One minute I was sitting on the beach at Bude, sun was shining, waves crashing and the next minute I had realized in about 15 minutes Marhamchurch’s unique revel was about to begin. Fortunately, it is only 6 or so minutes away…but a world away from the seaside delights of Bude. Here having taken various revivals is the Marhamchurch Revel, a local feast with decidedly curious additions. Here the quiet village celebrates their native said who is said to formed a cell on the location of the church and whose feast day was conveniently perhaps close to the ancient pagan celebration of the harvest, Lughnasadh! The revel has its origins in the medieval period, and possibly beyond, and records in the Cornish Record Office show that it was a rowdy and drunken affair and after many concerns over the behaviour of those who attended it died out. “On the 12th of August 1912 the Marhamchurch Revel was revived in a quiet style in the garden of Col. English’s house, Elm Cottage”. This revival looked at one point to have died out before it started! During the first world war, the revel was only remembered by local children taking flowers to the church for the saint. It took until 1931 for the revival to be established with more vigour again. This time taking a decidedly Lammas flavour being associated with the first harvest of August. I arrived just as the main street was being lined with onlookers and further down the street I could see a procession moving in the general direction. 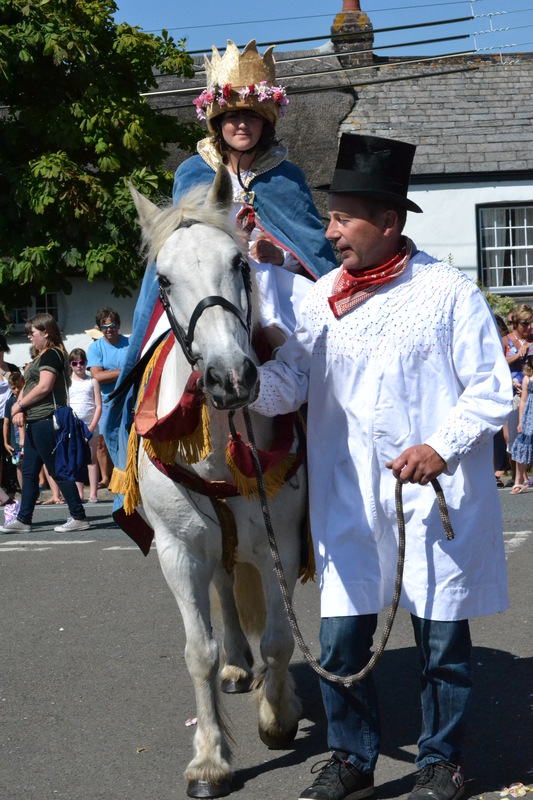 This consisted of flower girls, dances, St Morwenna, a marshal and a page boy. Boys boys carried green boughs said to represent the first harvest in the early part of August. 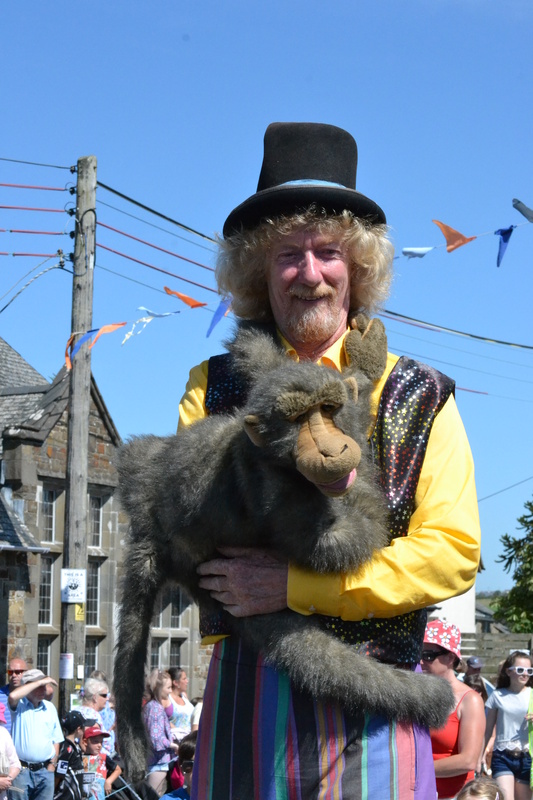 There was even a stiltwalker with a puppet monkey very traditional! Standing on a platform was the character of Father time, wrapped in a dark hooded clock and wearing a grey beard like a waylaid Santa, it is a role undertaken in upmost secrecy. He carries a hourglass and scythe – possibly borrowed from the grim reaper and reputed stands on the site of that original saintly shrine. That was rather spoilt by someone in the crowd shouting out ‘That’s Dave isnt it”…fortunately I didn’t know of Dave was! 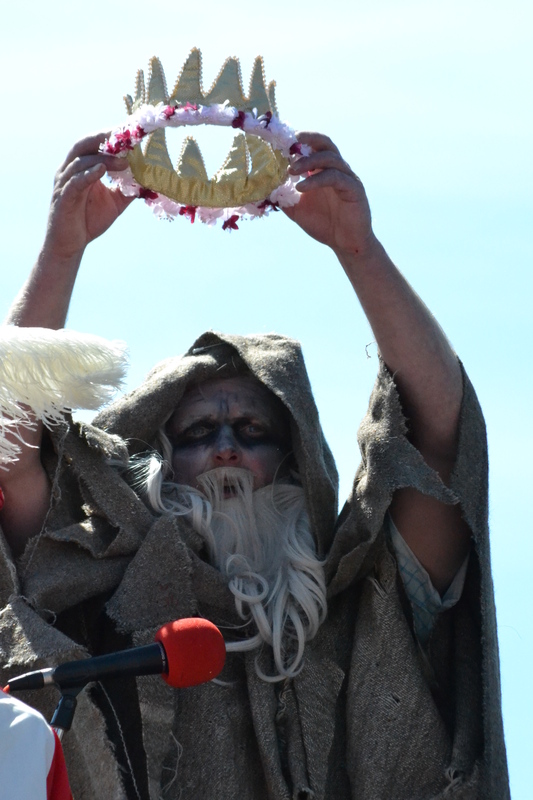 The crowning of the Queen is said to represent the Christianization of a pagan deity but to my mind it was just like any other May queen!…but then again what’s she? I particularly enjoyed the impact our safety conscious world had had on the ceremony – the crown was a riding helmet – great idea but it did not exactly fit well on the new Queen’s head! There is much formality in this custom. The Queen most be selected by the pupils of the local Church of England school, thus be a native of the village. The blue clock by tradition is passed from Queen to Queen and the Queen most always wear white! One can hearing those early 20th planners setting the ideas out to make it as Merry England as possible. After the ceremony the Queen on her horse leads the visitors to the Revel field a small patch of ground behind the houses. Here we were able to experience the typical fair of such a feast – dog show, bouncy castle, coconut shy and plate throwing and breaking and some local kids were certainly good at that! 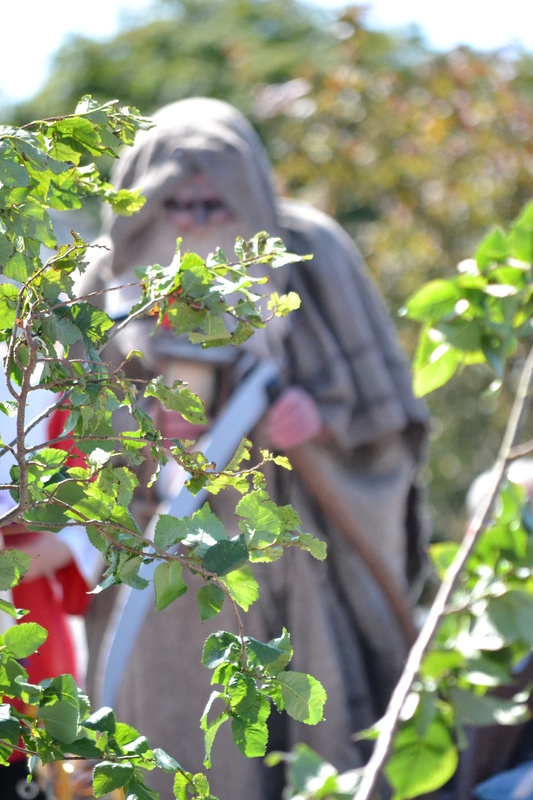 Added to the fun around the village scarecrows and a fancy dress party. All good fun. Marchamchurch is rightfully proud of its revel and come rain or shine a great welcome will be received there.